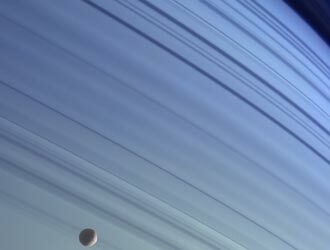 You are currently browsing the tag archive for the ‘Cassini’ tag. One of the smaller moons in the Saturn system is Daphnis, a little 8 km (5 mile) irregular satellite which orbits the gas giant within the outer rings of the planet (although I guess really the famous rings themselves are composed of innumerable “moonlets”). Daphnis, which has the irregular shape of a potato, orbits Saturn in a 42-kilometer (26 mile) wide belt in the rings—the Keeler Gap. The moon is responsible for clearing this narrow track, and it is felt that by studying this interaction we may learn about accretion and the enigmatic happenings of the early solar system (when more things looked like Saturn). Here is a picture from NASA’s Cassini probe which was released yesterday which shows little Daphnis producing waves in the Keeler belt. What a remarkable image! I need to post more Cassini pictures here. They fill the heart with wonder and give us a chance to get off-planet for a little breather. Since 2004, the Cassini spacecraft has been in orbit around Saturn. The robot probe (a joint effort of NASA, ESA, and the Italian space agency) received the most press when it launched a flying saucer lander onto Saturn’s planet-like moon Titan, but it is still out there doing amazing work. Last week, while I was busy writing about Halloween themes, the probe made its closest pass yet to Saturn’s ice moon, Enceladus. 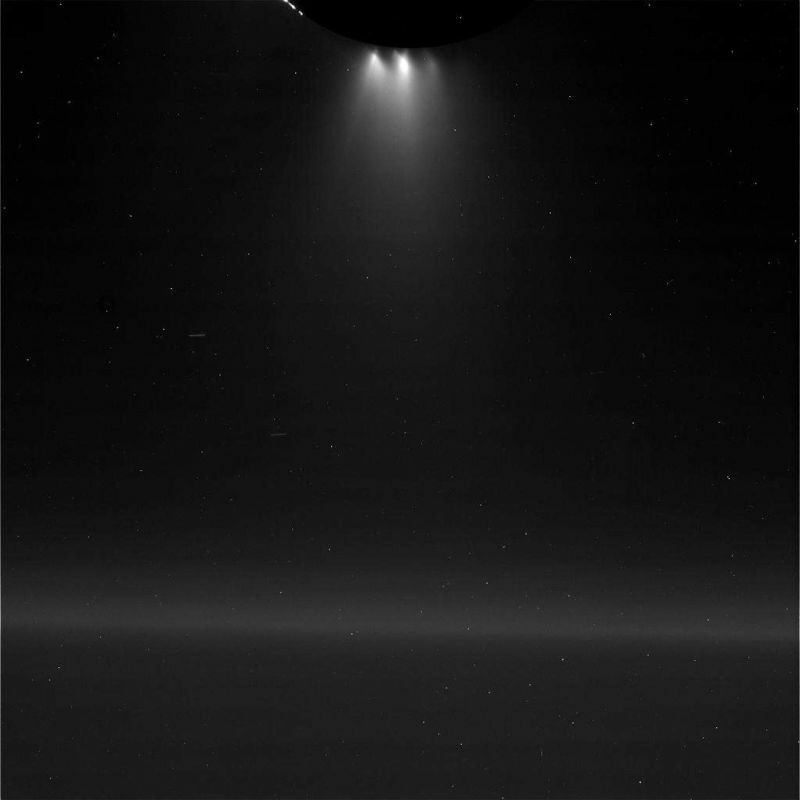 Enceladus is only 500 kilometers in diameter and it is coated in ice, but it is of great interest to scientists because ice plumes venting from the moon’s south pole seem to indicate a large polar subsurface ocean of liquid water. Warmed above freezing by tidal flux, this ocean beneath the ice probably has a thickness of around 10 km. On October 30th, Cassini flew by the icy moon at the dangerously close distance of 30 kilometers (18.6 miles). 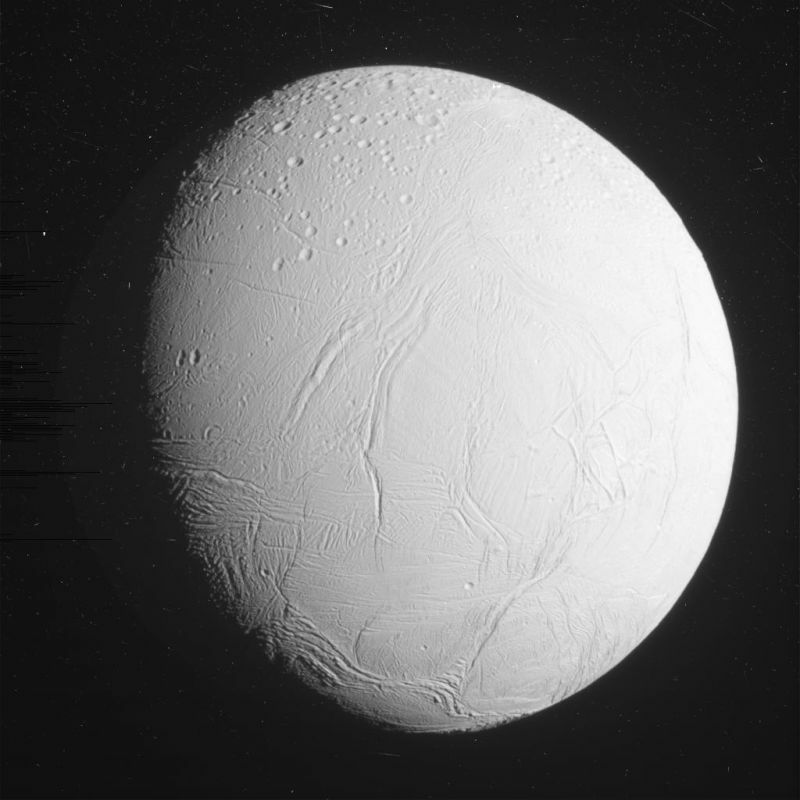 The probe was directly above the south pole of Enceladus and it collected a little flake of ice to analyze (which strikes me as incredibly amazing and beautiful). It will take some time for the ship’s devices to assay the drop of water from an alien ocean, but Cassini also snapped some photos which we already have. These are taken from point blank range above the south pole. The ocean is down there beneath the scratches and scars. What is the nature of this icy ocean? How long has it been there? Could it possibly harbor life? It’s been too long since we headed out to space. This is true of humankind, but it is also true of this blog…so today we are going to cast our eyes across the solar system to Tethys a mid-sized moon of Saturn. 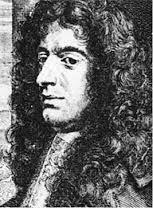 In 1684 the Italian astronomer Giovanni Domenico Cassini discovered Tethys. He initially named the moon in honor of Louis XIV, but his choice was later changed so that the moon is named for a first generation Greek titan-goddess. The moon has been approached by several human spacecraft, most notably…Cassini, which has dropped by several times (the robot space probe is named after the astronomer—the poor fellow has not been drifting in space since the 17th century). Of all the major moons in the solar system, Tethys has the lowest density: 0.98 g/cm3 ! This means that almost the entire moon is made of frozen water—it is essentially a huge round ice cube floating around Saturn. Tethys has two extremely prominent features—a giant crater 450 kilometers (280 miles) across (named Odysseus) and a huge ice canyon 2000 kilometers (1200 miles) long, 100 km (62 miles) wide, and 3 km (1.8 miles) deep, which stretches most of the way across the moon. 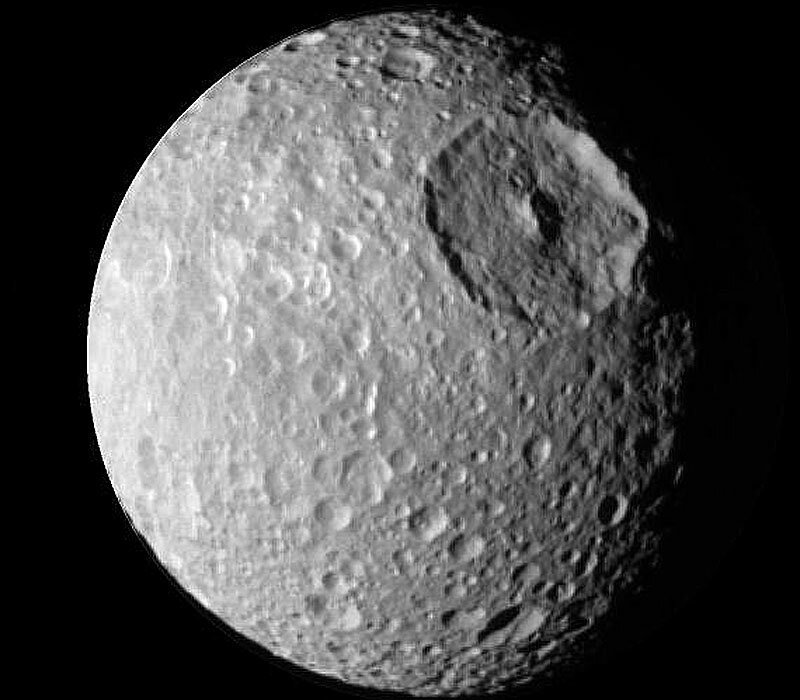 Unsurprisingly astronomers speculate that the two features are related and the massive impact which created Odysseus melted a chasm along the entire side of the planetoid. 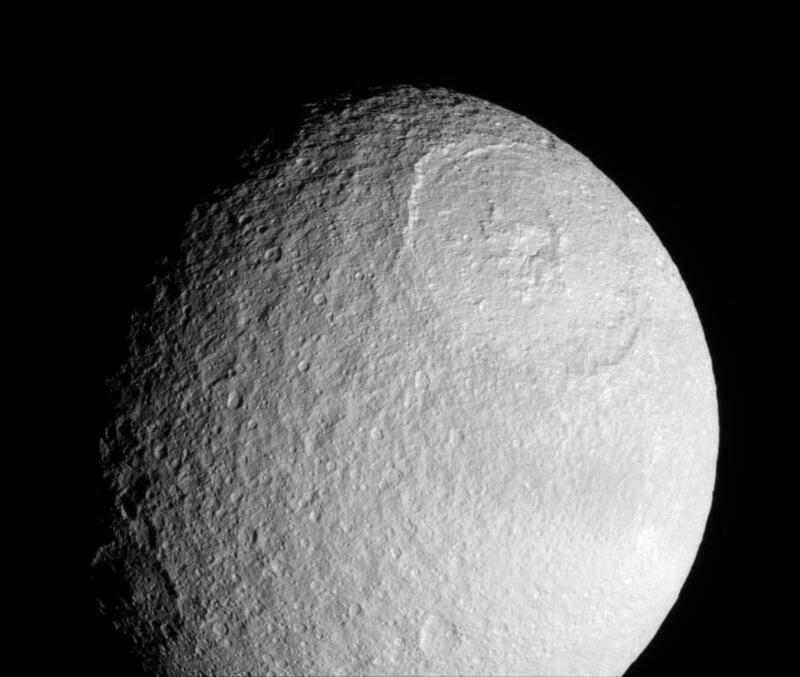 Although you might be inclined not to expect much activity from a ball of ice in the depths of space, Tethys seems like it may be geologically active, or, at least, it may have been once. The area around the hemisphere is comparatively flat and free of craters—which suggests that tidal flux from Saturn causes some melting—and possibly cryovolcanoes. Paleontologists and sharp-eyed readers already know the name Tethys. During the age of Pangaea (when all of the world’s continents joined to form a single land mass), the great ocean in the midst was named the Tethys Ocean. In Greek mythology, Tethys was the daughter of Gaea (the mother earth) and Uranus (the heavens). 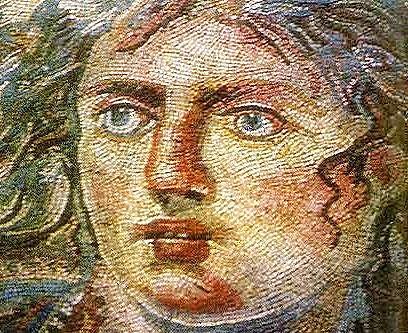 She was regarded as the mother of all waters and was married to her brother Oceanus, the first lord of the seas. The astronomers of the age of enlightenment who renamed the moon, could not have known it was composed mostly of water, but they chose well. The surface area of Earth is about 510 million square kilometers. That number adds some perspective to the giant storm which has been raging on Saturn since December and now covers approximately 4 billion square kilometers of the gas giant planet. 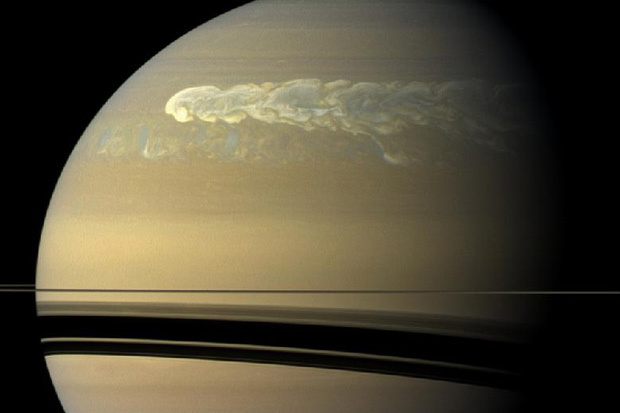 Saturn’s atmosphere is usually calm and tranquil–although powerful storms have been observed by telescope in the past. Now however Saturn is being closely observed by NASA’s Cassini space probe which is in orbit around the planet and we have some precise details. At the storm’s height, Cassini detected over 10 lightning strikes per second. Additionally, these lightning bursts can emit 10,000 times the amount of electrical energy as a typical lightning burst on Earth. Saturnian meteorologists (or whatever weather scientists for the great ringed planet are called) speculate that this super lightning is so powerful because of the juxtaposition of layers of water ice with layers of crystallized ammonia. Saturn’s weather is known to fluctuate with the change of the season on the frigid planet and the huge rings are presumed to affect the weather in unknown and unpredictable ways. The current giant storm is taking place in the northern hemisphere of Saturn, which is entering spring. Although Saturn’s storms are not as well-known as the Great Red Spot on Jupiter, the planet’s north pole does feature a hexagonal storm which has persisted for at least 25 years. Named for Jupiter/Zeus’ father (who was known as Cronus to the Greeks), the planet Saturn is the second largest in the solar system with a surface area of 4.27 x 1010 square km. The planet is orbited not only by its famous rings but also by at least 62 known moons including Titan, the only known satellite with a dense atmosphere, and Mimas, which features the largest known impact crater. 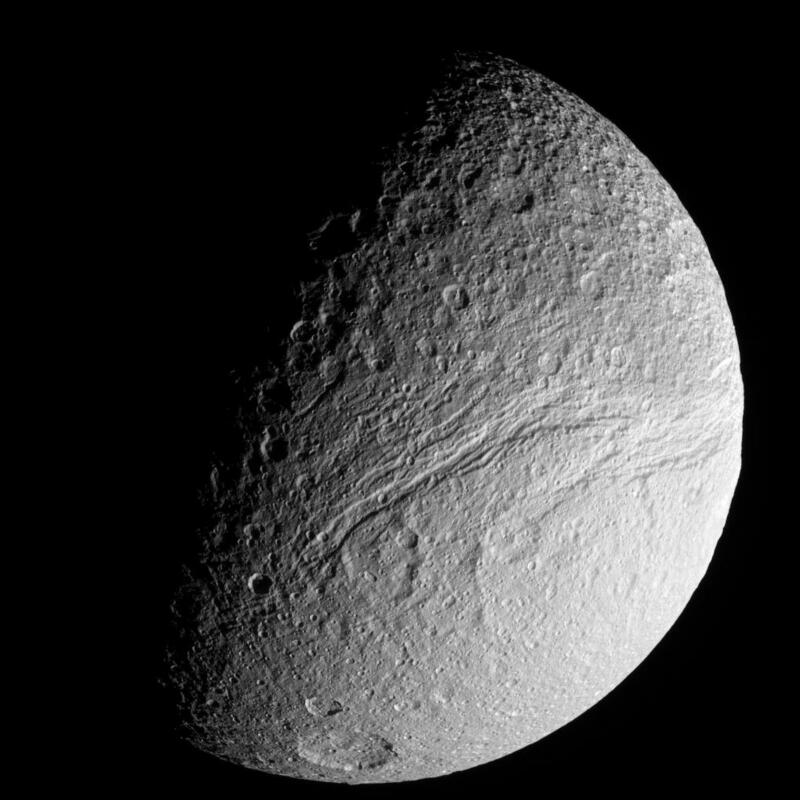 Herschel’s diameter is almost a third of [Mimas’] diameter; its walls are approximately 5 kilometres (3.1 mi) high, parts of its floor measure 10 kilometres (6.2 mi) deep, and its central peak rises 6 kilometres (3.7 mi) above the crater floor. If you were standing in the crater (which you should not do!) it would be a great broken plain surrounded by cliffs thirteen times taller than the Empire State Building. In the middle you could see a huge mountain slightly shorter than the tallest mountain in North America. Jagged craters and valleys as deep as Lake Baikal would lie around you. A great series of impact cracks on the opposite side of the moon would seem to indicate that the collision which created Herschel nearly shattered Mimas (which is composed principally of ice). The moon’s name might be of passing interest to followers of my Deities of the Underworld category. 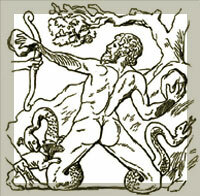 In Greek mythology, Mimas was one of the monstrous sons of Gaia. He was born with snakes for legs and he was clad in full armor. In the Aeneid, Virgil tells the story of how Hephaestus imprisoned Mimas under Vesuvius during Gaia’s great rebellion against the Olympian gods. As the imprisoned giant shakes so to does the area around the Bay of Naples. As I was researching this article, I was struck by how many moons Saturn has! As a special bonus feature, here is an alphabetic list of Saturn’s named moons (several more remain anonymous): Aegaeon, Aegir, Albiorix, Anthe, Atlas, Bebhionn, Bergelmir, Bestla, Calypso, Daphnis, Dione, Enceladus, Epimetheus, Erriapus, Farbauti, Fenrir, Fornjot, Greip, Hati, Helene, Hyperion, Hyrrokkin, Iapetus, Ijiraq, Janus, Jarnsaxa, Kari, Kiviuq, Loge, Methone, Mimas, Mundilfari, Narvi, Paaliaq, Pallene, Pan, Pandora, Phoebe, Polydeuces, Prometheus, Rhea, Siarnaq, Skadi, Skoll, Surtur, Suttung, Tarqeq, Tarvos, Telesto, Tethys, Thrym, Titan and Ymir. An immense hexagonal storm twice the diameter of earth is locked around the north pole of Saturn. Humankind discovered the feature by means of the Voyager 1 space probe in 1980 and we continue to study it with our Cassini space probe. So far, aside from hurricanes on Earth, this is the only eyewall atmospheric feature scientists have found in the solar system (an eyewall is a cloud formation where towering clouds swirl around an empty still center). Each of the sides of this feature is 8,575 miles long and the eyewall towers 20 to 45 miles tall. 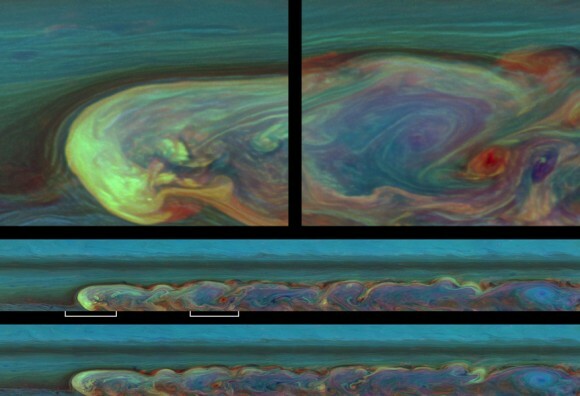 The eyewall clouds do not shift in longitude like the other striations in Saturn’s visible atmosphere. The huge honeycomb shape rotates every 10 hours 39 minutes and 24 seconds–the same period of rotation as that of the planet’s radio emissions (which is therefore assumed to be equal to the period of rotation of Saturn’s icy interior). 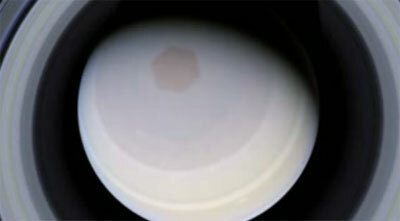 Saturn’s south pole has no comparable feature–although there is a prominent hot spot there.